Clad in Stormcast Eternals armour, with cloaks, tabards and ornate helms denoting their status as lightning-empowered shock troops of Sigmar. Dotted around their forms is the symbol of the Sacrosanct Chamber, the 3-marked anvil. Each wields a tempest blade and stormstave, with the option for 2 to carry a grandstave instead. The Dracolines they ride are large and fearsome, their forms incredibly dense and muscular; each of their 4 feline limbs ends in terrible claws, and their heads are squat and heavy. The Dracolines have little needs for armour, merely accessorised with a set of reins and saddle each. 1 of the models can optionally be assembled as a Lord-Arcanum, who has a specific head featuring no helmet faceplate (but still clad in a magnificent crest) and carries an aetherstave crackling with celestial magic. 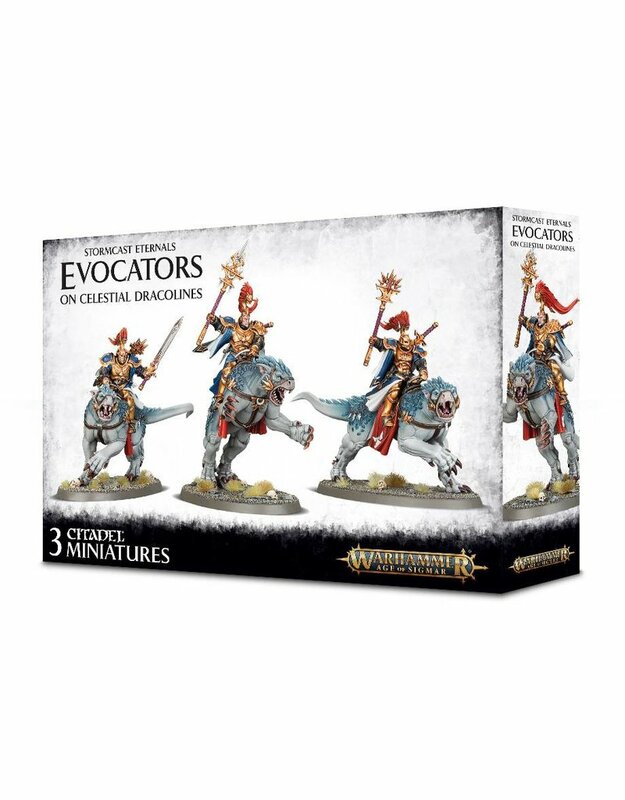 The other 2 miniatures are a male and female Evocator, who can be assembled with or without faceplates – these both feature options for assembly as Evocator-Primes, who feature a specific stormstave and lion-motif shoulder pad each.